Now offering strut channel to help secure and manage cables. 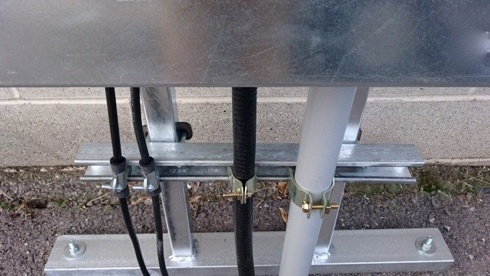 Above photo shows two RG8 sized coax cables protected with a foam sleeve and securely clamped to a length of strut channel which is attached to a KF7P Concrete Mounting Fixture. Next to the coax is 7/8” hardline (center), and 1.5” conduit (right). This photo shows the back side of the Concrete Mounting Fixture and attachment of strut to the fixture’s legs using our strut attachment kit. All hardware is hot dip galvanized. 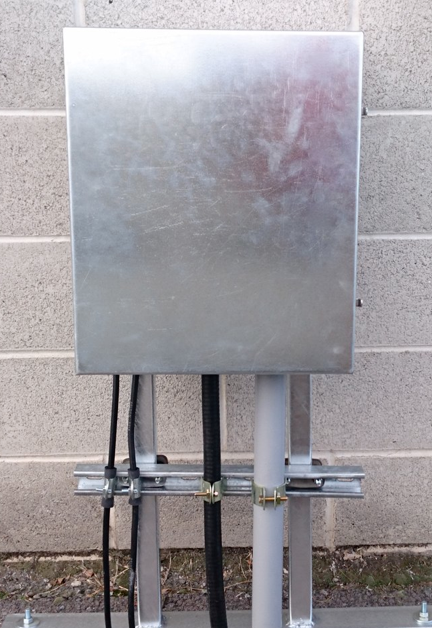 Photo shows large Junction Box attached to Concrete Mounting Fixture with strut and cables clamped securely below. 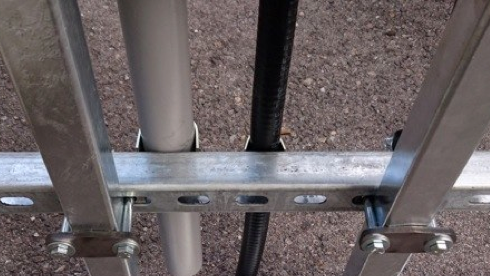 Large unwieldy cables, such as hardline, should be clamped to strut channel to prevent weight of cable from pulling on the arrestors which are attached to copper sheet inside box. Strut can also be used on wall mounted Entry Panel boxes as well. Just attach to wall underneath box and attach cables in the same way. Strut for entry panels can be screwed to wall under box (hardware not included). Strut is galvanized. Clamps for individual cables can be found below. Note: Lengths below are slightly longer than the entry panel box widths. This is done so that the strut comes without having the slotted holes on the back side cut in half. Strut for Concrete Mounting Fixture, 16” length. Fits all Junction Boxes M-XL. backing plates, washers and nuts. Strut for junction boxes comes in 16” width and comes with mounting hardware for Concrete Mounting Fixture as seen in photos above. Strut is galvanized and so is the mounting hardware. Clamps for individual cables can be found below. Clamps for individual cables and conduit sizes available here. If you need a clamp for a specific size cable or conduit, or aren’t sure if your cable will fit, let me know and I’ll track down the right clamp for you!